MP Thubten Tsewang, Leh MLA Rigzin Jora, MLC Tsering Dorje Lakrook, Chief Executive Councillor of Ladakh Area Hill Development, Chief Executive Councillor of Ladakh Area Hill Development Council (CEC, LAHDC) Gyal P Wangyal, Tibetans and Ladakhis. He rejoiced that His Holiness looked so well and thanked everyone present for coming to celebrate his birthday. Tsewang Thinles announced that in accordance with His Holiness’s advice the LBA has instituted classes in language and culture out of a sincere wish to ensure the survival of the Buddha’s teachings. While requesting His Holiness to continue to visit Ladakh, he declared that the Ladakhi people’s gift to him on his birthday was to try to put what he has advised into practice. The first of a series of song and dance presentations was performed by a group from the Sham Valley. A statement from the Tibetan Parliament in Exile was read by local Tibetan Representative Dhondup Tsering. It summarized His Holiness’s achievements in exile and the current situation in Tibet, concluding with expressions of gratitude to the people and Government of India. A Ladakhi cultural troupe, Dorje Stagmo and friends, next performed a Ladakhi folk song dressed in traditional white chubas and boots turned up at the toe. Ashraf Ali Barcha of the Anjuman Imamia, a Shia Muslim welfare organization, speaking on behalf of all Ladakhi Muslims greeted His Holiness on his birthday and prayed for his long life. He added that Ladakhis were fortunate that His Holiness, a sincere messenger of peace in the world, visited their region so frequently. He called on all Ladakhis to take responsibility for fulfilling His Holiness’s counsel to maintain religious harmony. Girls from Ladakh Public School, Lamdron School, Mahabodhi School and Druk Pema Karpo School performed a delightful song and dance. Director of the Tawang Foundation, Maling Gonbo, recalled that the Nalanda Tradition was first established in Tibet and later spread into the Himalayan Regions. He mentioned a recent conference in Gurgaon at which representatives of Ladakh, Himachal Pradesh, Uttarakhand, Sikkim, and Arunachal Pradesh, as well as the Tibetan monasteries in South India, held discussions about culture and identity. At the conference’s conclusion participants resolved to design a curriculum to enable the study of ancient Indian knowledge as preserved in the Nalanda Tradition in temples and monasteries across the Himalayan Region. The plan envisages involving laypeople as well as monks and nuns. Lochen Rinpoche presented a copy of the resolution to His Holiness. Tsering Choeden and her female colleagues performed another traditional Ladakhi folk song and dance. (CEC, LAHDC) Gyal P Wangyal praised His Holiness for setting an example everyone can follow. A group of people from the three provinces of Tibet charmed the audience with a performance derived from the Tibetan Lhamo or opera tradition. They sang and danced to the accompaniment of simple drum and cymbals. On behalf of the Buddhists of Mongolia Woeser Rinpoche paid homage to His Holiness. He stated that it was due to relations with the Third Dalai Lama, Gyalwang Sonam Gyatso, that Mongolia became firmly established as a Buddhist land. Then, in the early 20th century Buddhism came under attack and the country entered a period of destruction and suffering. In 1979, His Holiness visited Mongolia for the first time. Consequently Mongolian students joined re-established Tibetan monasteries, medical institutions and schools to train and study. Now there is a new generation of qualified teachers who have reintroduced the rigorous study of logic and philosophy. Mongolians are grateful to His Holiness for this and join together to pray that he lives long. 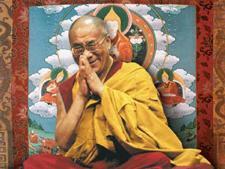 He noted that on this day in 1935 His Holiness was born in Taktser a remote part of Tibet. He was enthroned at the age of six, formally took responsibility for Tibet’s spiritual and political affairs at sixteen and, after the country had been occupied by Chinese Communists, went into exile at twenty-four, following which he made a great impression on the world. He described His Holiness as a living embodiment of happiness, love and compassion. He cited his recent participation in the launch of the Delhi government’s Happiness Curriculum and his steady promotion of secular ethics as examples of his contribution to human peace and happiness. The Sikyong remarked that if India really wants to be number one, she should recall that in the past Nalanda was the number one university in Asia and Buddhism was India’s number one export. Nowadays, His Holiness is working tirelessly to revive appreciation of ancient Indian knowledge of the workings of the mind and emotions in this country. His Holiness was presented with a gold and silver Wheel of Dharma as a token of gratitude on behalf of the Tibetan residents of Leh and Changthang. This was followed by all the artists who had already performed joining together to sing an auspicious song. Requested to say a few words, His Holiness walked to the front of the stage from where he said he could see the faces of the people he was talking to. “For this celebration of my birthday we have here Ganden Trisur Rinpoche from whom I have received significant teachings. We also have Drikung Chetsang Rinpoche, other eminent Lamas and scholars and a huge gathering of members of the public. When I arrived in Leh the other day the sky was overcast and I wondered if we might have rain today, but instead the sun is blazing hot. I have received many messages of goodwill today and I would like to thank everyone who has sent them. “When the LBA President announced that they were working to put my advice about study and practice into effect I was really pleased. We pray for the benefit of all sentient beings and when we look into the night sky we can see infinite planets and stars in infinite galaxies where there are infinite such beings. This world is part of that universe and on this earth are many birds, animals and insects, but there’s not much we can do for them. The beings we can help are the human beings who are physically, mentally and emotionally like us. My goal is to try to bring them peace and happiness. “If you are constantly angry you’ll be unhappy and your health will suffer, but if you’re compassionate towards others you’ll be happy and well. “I’m also concerned to promote harmony amongst our various religious traditions that convey a common message of tolerance, love and compassion. Their different philosophical views are all means of promoting these virtues. Here in Ladakh religious harmony prevails—please keep it up and wherever you can encourage others to work for it too. This is something we can each do in our own way. “My third commitment is as a Tibetan. The people in Tibet mention my name on their dying breaths, so, clearly, the majority of them put their trust in me. The cause of the Tibetan people is a just and worthy cause. As well as a responsibility towards the people of the Land of Snow, I feel bound to work to preserve the culture and language of Tibet. “Keeping Tibetan religion and culture alive is something that rests on the shoulders of Tibetans and the people of the Himalayan Region. The great Indian master Vasubandhu advised that the teachings of the Buddha can be classed as scriptural and experiential. To keep them alive we need both to study and develop experience of them. This means reading the scriptures and applying what we learn by exercising the Three Trainings in ethics, concentration and wisdom—in other words, study and practice. “Lochen Rinpoche has told me of efforts that are being made to put this advice into effect by turning temples and monasteries throughout the Himalayan Region into centres of learning. Time moves on unceasingly. We cannot change the past, but we can shape the future. This is why these schoolchildren here are really a source of hope. Turning to his Muslim friends he said he knew they attributed their religious teachings to Allah, but they too might find benefit from acquainting themselves with the logic and reason of the Nalanda Tradition.